Jack in the Box has introduced Cheesey Macaroni Bites. 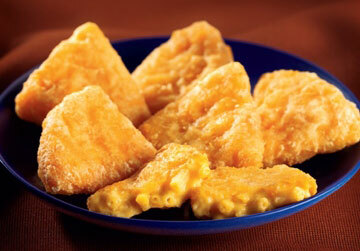 They are "wedges of macaroni noodles and real Kraft® cheese enveloped in a crunchy tempura-style coating." "Mac 'n' cheese is an American classic that's universally loved," said Teka O'Rourke, director of menu marketing and promotions for Jack in the Box Inc. "Our new Cheesy Macaroni Bites offer the same great flavor of the original dish, but in a unique, finger-food style that's very convenient and portable." Jack's Cheesy Macaroni Bites are available for the suggested price, excluding tax, of $1.69 for three pieces and $2.99 for six pieces. By the way...the above description of these Macaroni Bites is the second time I've noticed "tempura" being used to describe the batter on fast food this week. From McDonald's official Q&A site: "McDonald's Chicken McNuggets® are made from white meat chicken coated in a light tempura batter." Is "tempura" the new food industry catch-phrase for "batter fried"? Jack's Cheesy Macaroni Bits, 6 pieces, has 440 calories, 230 calories from fat, 25 grams fat, 10 grams saturated fat, 4 grams trans fat, 30 mg cholesterol, 1220 mg sodium, 21 grams carbs, 2 grams fiber, 3 grams sugars and 6 grams protein. They're off the menu now. They were seriously delicious! But damn, after seeing what all that deliciousness is made of... probably for the best. BRING BACK THE MACARONI BITES!!! well they're obviously prepared differently if they are tempura battered. it isn't some kind of jive talk. being cold mixed, and only lightly mixed, the batter stays light and flaky. i wish there was a jack in the box around here to try those. guess i'll have to make them myself.